Ecouen. Musée national de la Renaissance. From 11 October 2011 to 27 February 2012. One of the best exhibitions this winter has fortunately been extended until 27 February, providing us with the possibility of making up for lost time and discussing it here at last. There is almost a month left for visitors to go see it in Ecouen and we highly recommend making the short trip north of Paris. There were several possible ways of presenting the majolica : organize the visit (and catalogue) by studios, choose a chronological presentation or else focus first on the iconography then group them according to the subjects depicted. The third option was chosen, paying careful attention to limiting the number of works in order to avoid any overabundance as is often the case in permanent museum galleries, which tends to hamper the study of each work . The period of the exhibition goes from 1480 to 1530, excluding however Francesco Xanto Avelli who was recently highlighted in a retrospective at the Wallace Collection. These fifty years of production were deeply affected by the appearance, around 1480, of historical (or istoriato) majolicas (ill. 1) with their ornamental decors of antique geometric or grotesque motifs progressively replaced (although not entirely disappearing) with scenes of figures from the Bible, Antiquity or mythology, as well as allegories, stories, fables and satirical depictions. All of these genres are represented in the exhibition with pieces from various European museums. 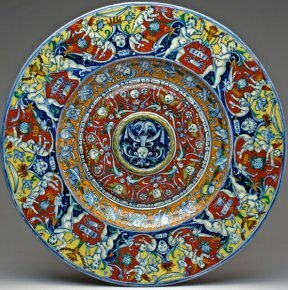 A brief explanation of the majolica technique is provided. We should remember that it consists of clay shaped into the desired form, cooked then decorated by applying a first coat of tin glazing and a second of coloring oxidants for painting the subjects. A second firing fixes the decor giving it its smoothness, making it waterproof and imparting the shiny aspect which characterizes these ceramics. A third firing, after applying particles of copper and silver, completes the finished product emphasizing its brilliance. Although the forms are often functional (plates, cups, vases...), the objects were used strictly on exceptional occasions. These were often presents intended for weddings or state visits. There were many studios in Italy, but majolica painters changed easily, moving from one to another and few are well documented. Many pieces are thus anonymous or else attributed to masters with a conventional name. Among the rare artists whose identity has come down to us, one of the most important, Nicola da Urbino, was identified thanks to his signature, found on five pieces which are signed or bear his monogram ; the rest of his work was attributed by comparison. He is particularly well represented in the exhibition (ill. 2) which closes notably with an ensemble of six pieces which were part of the famous table service belonging to the Museo Correr, made up today of seventeen plates and cups. 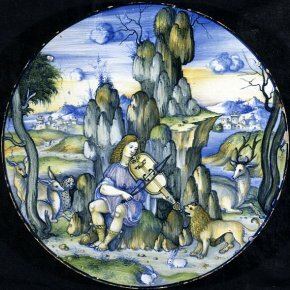 We reproduce here, for example, Orpheus Playing before the Animals (ill. 3). The artist was known as the Raphael of majolica because of the quality of his works as well as the fact he hailed from Urbino but not because of any direct link to the master’s painting. There is no established connection with any work of Raphael’s, proving that he was also responsible for designing his own compositions, a rare instance in this type of object. 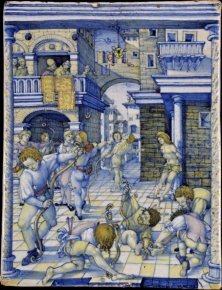 Most of the majolica painters found their inspiration in the mural paintings (notably those of Pinturicchio in Sienna), in the engravings after the masters, be they Italian  or Northern European, or else directly from drawings executed especially for this purpose. The Palais des Beaux-Arts in Lille holds a collection including several drawings associated with known majolica pieces. Even more surprisingly, some of these faience pieces, with a white and blue decor, reflect a particularly early influence from Chinese ceramics (ill. 4). 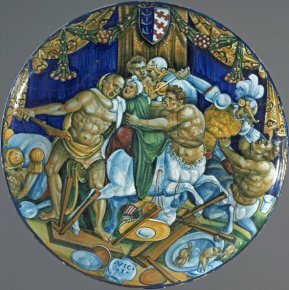 While Nicola da Urbino constitutes one of the indisputable heights of majolica art, this exhibition however cannot be reduced to one name alone. Visitors will discover a great many masterpieces of which we can only reproduce a few examples. We would also refer our readers to the short but detailed catalogue where each of the objects is accompanied by an entry, unfortunately without a historical background. Also, an essay explaining the characteristics of each school would have been very useful. 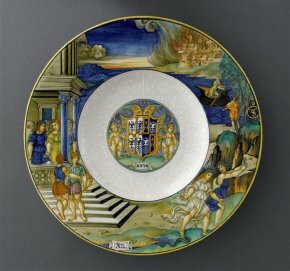 We conclude this article with two illustrations of very different objects but equal in their very fine quality : basin for an ewer, dated 1509 (ill. 5), from Montelupo, shows that the grotesque decors remained after the appearance of the "istoriati" ; and a plaque representing The Martyrdom of Saint Sebastian (ill. 6) by an anonymous artist (who signed BT or TB), active in Faenza or the Marche region. The various influences, reflecting a knowledge of the Venitian school, such as Mantegna or Pollaiolo, show that the artists were abreast of the latest currents and that, far from being a lower art form, often rivaled the most beautiful pictorial achievements. Curators : Françoise Barbe and Thierry Crépin-Leblond. Visitor information : Château d’Ecouen, Musée national de la Renaissance, 95440 Ecouen. Tel : + 33(0)1 34 38 38 50. Open every day except Tuesday from 9.30 to 12.45 and from 2.30 pm to 5.15 pm. Rates : 6.5 euros (reduced : 4 euros). Collective work. 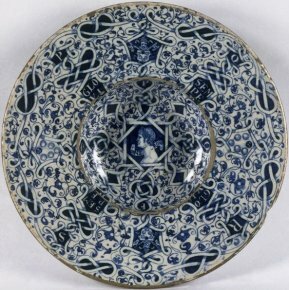 Majolica. La faience italienne au temps des humanistes. RMNGP, 200 p., 39 euros. ISBN : 9782711858095. We would like to say that having always spoken out in favor of dense museum hangs, we cannot recommend the opposite for majolica or other art objects. However, visitors not specialized in the study may be overwhelmed by display cases overflowing with cups and plates. Raphael was in fact the principal model, via the engravings produced by Marcantonio Raimondi.